You are at:Home»Budgeting»Introducing KOHO Joint Accounts! 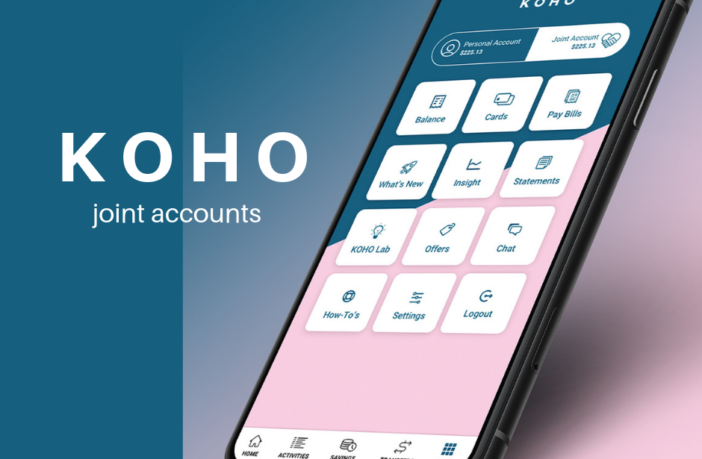 The newest thing in Canadian fintech is KOHO joint accounts, making it easier than ever to share expenses and savings goals with someone else. If you have a roommate or a co-parent or anyone else you need to split bills or save for something with, KOHO is the brand new solution to sharing money. Please note that the following is NOT a sponsored post, but I do get $20 when you use my referral code BRIDGET20 to open an account with KOHO and make your first purchase. However, you also get $20 when you use that code! If you want to open an account with KOHO but don’t want either of us to get a free $20, simply visit koho.ca to sign up! KOHO is an innovative Canadian fintech company that lets you track your spending, save money, and earn cash-back on your purchases. It functions more or less like a prepaid Visa card that offers cash back. You get all the convenience of a credit card without any of the risks of going into credit card debt. But it gets better! The card is tired to a slick spending tracking app that also lets you set savings goals, round-up your purchases, and automate your finances. Still unconvinced? Check out my full KOHO Review here! They’ve been my favorite budgeting app for more than a year, and have helped me save literally thousands of dollars towards my financial goals while reigning in my spending. I am not a frugal person and I hate to have my spending restricted in any way. KOHO has made it easy for me to enjoy things without going overboard. It is the only fintech tool that’s ever actually changed my behavior. This is why I can’t stop singing their praises! What are KOHO joint accounts? KOHO joint accounts let you get all the perks and benefits of KOHO, except amplified by sharing with someone else. Enjoy the convenience of a prepaid credit card, track all your spending, save for goals, and earn cash-back. The best part? You don’t have to use KOHO joint accounts with a romantic partner. You can open a KOHO joint account with anyone you need to share expenses with: a roommate, a co-parent, anyone! You know who you share bills and dreams with, so you get to decide who you want to share a KOHO joint account with. This is probably the biggest and most unique perks of a the KOHO joint account. For most traditional joint bank accounts, they usually have to be set up with a romantic partner. However, chances are more likely than not that at some point in your life you’ll be sharing money with someone you’re not romantically involved with. KOHO makes that easy. Of course, you can still use KOHO with your main squeeze and the joint account is an awesome way to simplify couples finances! In order to use KOHO joint accounts, both people need to have a KOHO card. If you’re not yet a member of KOHO, sign up using my code BRIDGET20 and you’ll get a free $20 added to your account when you make your first purchase with the card (and an additional free $40 if you set up direct deposit!). If you’re already signed up but the person you want a KOHO joint account with is not, you can give them my code (thanks!) or you can send them your referral code and you’ll get a free $20 when they sign up! Yes, the math is right: you’ll get $20 for signing up with my code & making a purchase + $40 for setting up direct deposit + another $20 when you refer your friend/partner = $80 in free money. Once you’re both signed up for KOHO, one of you simply needs to create a joint account in the app and invite the other person. You then fund the account, and it works just like your individual KOHO account except now its shared. You’ll earn cash back, can set up a round-up for purchases, and create shared savings goals. You’ll be able to toggle between your personal KOHO account and the KOHO joint account directly in the app. While all your joint account activity will be visible to the other account holder, your personal KOHO account will stay private. KOHO joint accounts are the best way for shared expenses and shared financial goals. Whether you joint bills to manage like groceries and utilities or you’re saving up for a vacation together, KOHO joint accounts take all the awkward back and forth out of the equation. Imagine never having to ask your roommate if they paid the electric bill again, or pester your significant other for their share of the grocery money. Also, imagine getting real-time updates when they do pay a bill or pick up groceries! KOHO has you covered. I’ve personally been using KOHO for over a year, and I’m still as obsessed as I was on day one. In the past 12 months, I’ve earned $79.78 in cash-back, which means I’ve spent nearly $16,000 using my KOHO card. If that seems like a lot, it’s because I linked my Starbucks card. Ha! Just kidding, I actually use KOHO for everything I can use KOHO for. This is how I buy groceries, gas, baby clothes, pay for Netflix… basically everything. I set up my KOHO card to be loaded with my spending money every payday, so part of my paycheque is direct deposited right onto the card. I love this method because I know exactly how much I have to spend each month. When my KOHO card is empty, I have to stop shopping until next payday comes around! I opt to round up every purchase to the nearest $5, and this has let me save more than an extra $700 in the past 12 months. Personally, whenever my round-up total surpasses $25, I transfer it to a savings goal. On a monthly basis, I always have two ongoing goals: an extra car payment ($250) and a little boost to my TFSA savings ($100). Thanks to round-ups, I usually hit these goals way before the month ends. I also recently linked my Wealthsimple account to KOHO. I set up an automatic transfer from my KOHO card to my Wealthsimple account so I can keep saving and investing for the future. RELATED POST: How to Use KOHO and Wealthsimple to Spend, Save, and Invest! Automating this transfer to Wealthsimple means it happens without me having to worry about it, and since my KOHO balance is always being buoyed up by round-ups and cash-back, it makes this monthly investment feel totally painless. Sharing money with someone else is rarely a smooth ride. No matter how clear you are about rules, boundaries, and expectations, something’s bound to go awry. And because it’s something as emotionally charged as money, this can bring up nasty emotions of anger, betrayal, and frustration. 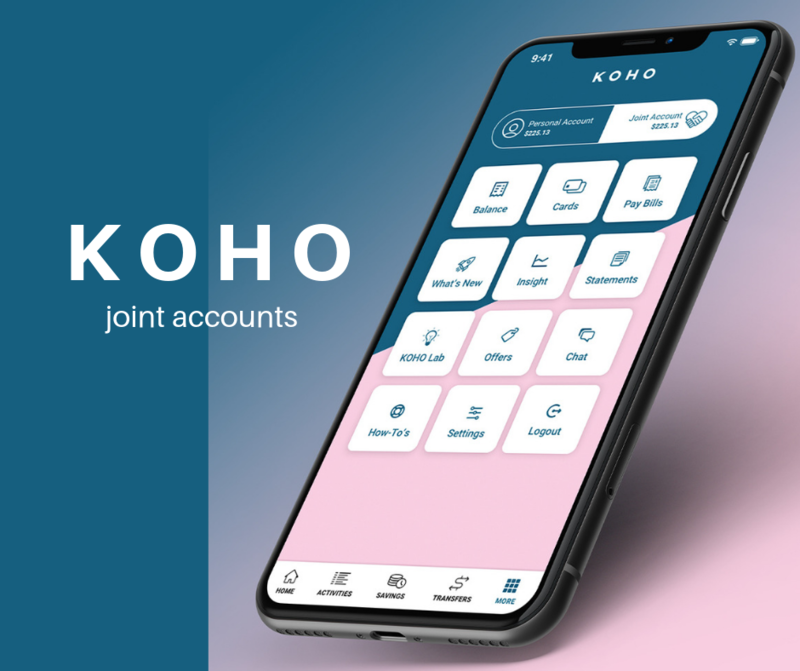 KOHO joint accounts make shared finances easier to navigate. You can share as much or as little as you need, depending on your circumstances. KOHO joint accounts are perfect for couples, roommates, or anyone else that needs to split bills and share savings with someone else. That’s a pretty cool app. I use my cash back credit card for all of my purchases instead since I can get 2% cash back that way. Still, for people who are worried that they’d get into credit card debt, I think this app sounds like a great middle ground. And way to go for earning all that cash back! I’m beyond excited! I have wanted to use Koho since your last review, but held off because my husband and I combine our spending on groceries, gas, and such. I emailed and asked about joint accounts, and they said they were working on it. But now we can do it! YAY!